Mkay, so you might've noticed I haven't included a fruit/veg size comparison in this update. It's because nothing seems to agree! My What-To-Expect app says she's a cauliflower ... which the size-chart I'd been using previously says she was on Week 25 o_0 I don't really know how there is no consistency. There was in the beginning. So now I give up. I'm pretty sure she's over a kilo now tho, since she was 914g at the previous scan and apparently she grows 200g a week now! Gotta triple that weight before birth, you know? Unfortunately, I don't know where she is going to go! I already feel huge! 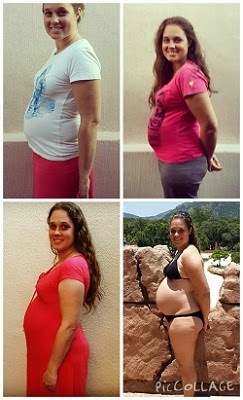 I started taking "bump" photos at 16 weeks and we do one every 4 weeks ... shewee, can not believe the change! It's not as noticeable when you're living with it day-to-day! 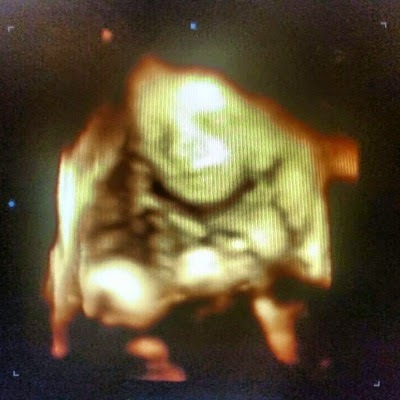 Yesterday we had the 4D scan. Again I was a little nervous because she had a rather quiet weekend ... I supposed because we were so busy. And mostly I feel her when I'm lying on the couch watching TV or in bed while reading ... and there wasn't much of that on the weekend. Yesterday, thankfully she was back to normal and even put on a show while I was in the bath. It's still super weird watching my tummy move around. Haha. The Trucker seems to have lost a little interest cause she stops whenever I tell him to come watch. Typical. But he really seemed elated by the 4D scan. It's quite incredible! And we did get some decent face shots! Her head is on the opposite side from our last scan and she was no longer spine-forward :) And she was wriggling about ... none of which I could feel. Which also made me feel better. Cause it means that just cause I can't feel her all the time doesn't mean she's not mobile in there. I can't remember if there was anything else to update ... the 4D scan kinda overshadows everything else - haha. Oh yes, we saw the lawyer last week. Absolutely worth the peace of mind, I'd say :) We used BKM in Rosebank because I work with one of the partner's sons. The bit that impressed me most was that the lawyer we met with has a child with another lawyer and they've also decided not to marry. And I agree, if anyone would know if there were legal implications of raising a child with your partner, without being married, it'd be them :) And, in spite of ALL the people telling me that so-and-so-that-they-know just got legally married quickly beforehand, to make it easier when they had the kid, there really is no legal need or benefit to do it. We will likely have to meet with a Tax lawyer next to discuss how best to structure our wills and stuff. It was kinda terrifying knowing how many of my friends with kids don't have wills ... your money just goes into a guardianship fund run by the government and only becomes available when the child turns 21. And apparently by then the money has often been lost or forgotten. Scary stuff, especially since this apparently happens *even if* you have a will and leave everything to your child (a minor). I definitely wouldn't trust the government with my child's inheritance! What else? Oh yes, we've booked ourselves in for an Infant CPR course, run by a neonatal ICU nurse. Am really looking forward to that cause I haven't done any first aid or CPR training before. Am also a little nervous since then you likely become hyper-aware of all the things that can go wrong ... but I'd rather be prepared! I read somewhere that the baby is more active when you are not, because the movement of your hips rocks them to sleep. I quite liked that. Interesting, my SO and I are also not married. We made sure to draw up a joint will before I gave birth but apart from that have not done anything different to married parents I guess. Maybe we should visit a lawyer too. You look sooo good!